Are you celebrating the arrival of a New baby or a Christening in the family…..you may have a new grandson or granddaughter, niece or nephew who has just arrived or is being christened…….what better way to enhance your celebrations than to have a special, unique and personalised cake as the table centrepiece for your celebration (baby will obviously be THE centre of attention!) 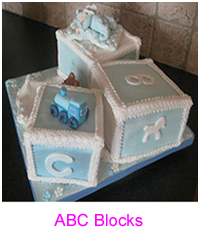 offering a great photo opportunity and memory of baby’s first celebration and special cake! 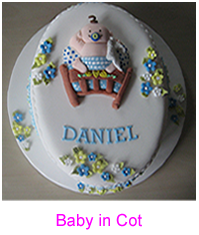 I can offer a wide choice of sponge flavours and styles of décor to suit your preferences for the boy or girl in your family. Some recent examples that I have made for customers can be seen in my gallery but if you have your own different ideas or photographs or pictures that you’d prefer please that can certainly be accommodated. Please do not hesitate to contact me and I am sure that you will be delighted with what I am able to produce for your special occasion!